Its all gone dark..that’s because bats only come out at night. Welcome to their world…… Before starting this section I knew nothing about bats. 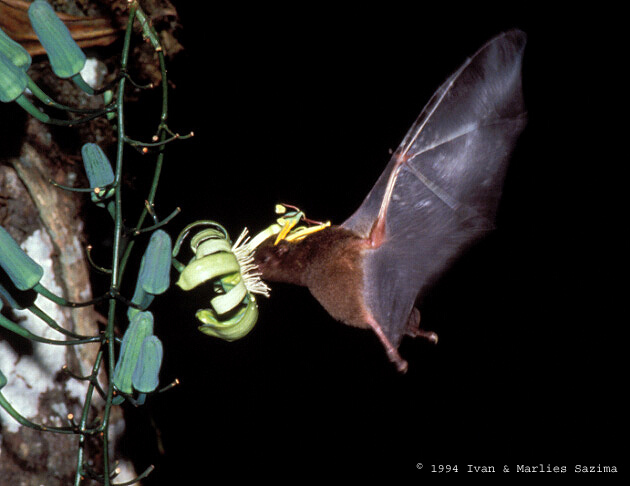 Amazing creatures…did you know that many important food crops are bat pollinated? Many thanks to all the bat people, but also special thanks to Ivan & Marlies Sazima for letting me use over a dozen stunning images of both bats, bees and a wasp! 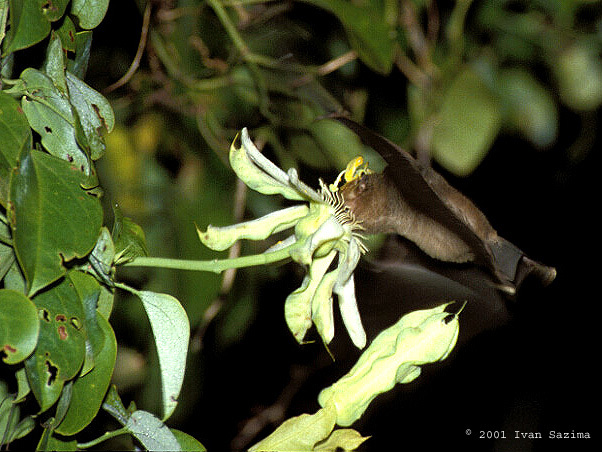 Some bats are thought to visit 50 flowers in night. These creatures are probably the most misunderstood creatures in the world. They come out while we sleep and are back in their roosts long before we are up and about in the morning. People still believe that bats will get tangled in long hair and will need hospital treatment to remove them. Dracula and other horror movies don’t help their image. Most people only get to see a fleeting glimpse of a shadow that shoots by in the twilight. In Africa tribes believe that bats bring bad omens, while in China bats bring good luck and can be seen embroidered on the gowns of emperors. The Chinese word ‘FU’ can mean bat or good luck depending on its pronunciation. Bats belong to an order called CHIROPTERA, which means ‘hand wing’ in Greek. They are the only mammals that are capable of true flight. Flying Squirrels can’t fly but can only glide downwards using a flap of skin stretched between their front and back legs. The wing of a bat is very similar to our hand except that its fingers are elongated. If we were to have fingers like a bat’s they would be about 6 feet long. There are almost 1000 species of bats, half of all known mammals in the world, living on every continent including within the Arctic Circle. Worldwide there are only 2000 species of mammal. Bats belong to two bat sub-orders microchiroptera and megachiroptera. Microchiroptera are small bats with quite large ears and are the sort of bat people living in temperate areas are going to see. 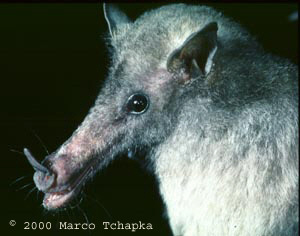 Microchiroptera bats eat insects while the megachiroptera with their large eyes eat fruit and are found mainly in rainforest. There is one species of bat in the wrong sub-order. It is one of the megachiroptera that is so small it was wrongly classed as a micro bat. Bats range in size from the smallest called the HOG-NOSED BAT at 2g/. 07oz. This is the size of a queen bumblebee compared to the largest bat in the world that has a wingspan of 6 feet. This bat is the KALONG weighing 1kg/2 pounds from Thailand. Few people realize that bats are mammals and nourish their young on milk. They have the same senses as us plus one extra. This is their navigating system called ECHOLOCATION. This can also help bats catch their food. With this bats can see their nighttime world with more accuracy than we can see it during daylight hours. Using this a bat can avoid something in its flight path the width of a human hair. Bats can catch 3000 insects a night using echolocation, which is the same as you and I eating 50 large pizzas in 6-8 hours. Bats echolocate at such a high frequency we can’t hear them as they fly around. The places that bats go to find food are in large planted gardens, overgrown lanes, along rivers or low over ponds. Some bats fly as high as swallows do during the day. Due to the growth of human habitation bats are becoming more dependant on man to provide crevices for bats to roost and breed in. the natural place for a bat to be is in an old tree that has a rotten core with a small hole to allow access. Some bats are quite happy to live under exfoliating bark. As all really large old trees are now gone from the countryside bats are looking for alternative roost sites. A small hole in the gable of a house is the same as a hole in a tree to a family of bats. Bats don’t really mind if they are in a cavity wall, behind hanging tiles, under lead or behind false shutters. Bats in Europe are protected under the Wildlife Order 1985. This makes it illegal for anyone with out a license to intentionally kill, injure or handle a bat of any species, to posses a bat, whether dead or alive (unless obtained legally) or to disturb a bat while roosting. Photographing bats requires a license from the Dept. of the Environment. It is also an offence to sell or offer a bat for sale. The law does allow the public to care for injured bats provided they are released when the bat is well enough to fly. Bats have been given this protection because of their special needs especially when they are roosting which is usually in or around an inhabited building. If bats are not wanted please go through the relevant organizations in your area e.g. DOE (NI) Environment and Heritage Service or English Nature. Bats go to caves, tunnels, icehouses and mines to spend the winter hibernating. We still don’t know where the majority of bats go to for the winter months. No, there are almost 1000 different bats in the world. Ranging in size from a bumblebee to a small cat. Why can’t I hear a bat? This sound is beyond what we can hear but within the hearing of cats and dogs. This sound is called ultrasonic. How many bats can live together? How can they find food? By using echolocation bats can ‘see’ insects flying in front of them. Fruit bats find their food by smell as do pollen and nectar feeders. Bats eat many harmful insects like mosquitoes. One small pipistrelle can eat over 3000 insects in one night. Pollen and nectar bats pollinate fruit that you and I eat. Bananas, mangoes and cashews are bat pollinated. Copyright © 2000 Mark Smyth All rights reserved. 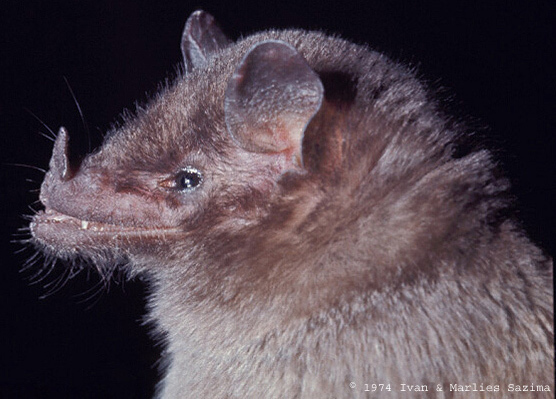 Different bats eat insects, small mammals, fish, lizards, frogs, fruit, pollen, nectar, blood & even other bats. The fruit, pollen & nectar eating bats are essential to the survival of the rain forests both with regard to pollination & seed dispersal. Plants & trees that bloom at night rely on bats & to a lesser extent moths & any cleared area of forest will depend largely on seed dispersed by bats to recover. 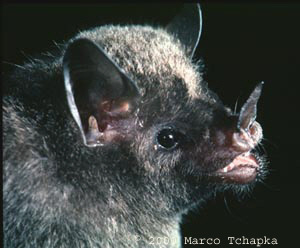 Many of the nectar eating bats are in sub family Glossophaginae, Glossophaga. 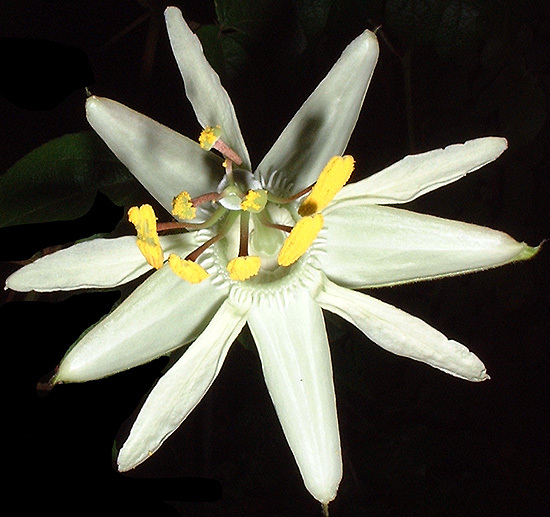 They rely on sight & smell (perfumed flowers & nectar) to locate their food sources & so the night blooming flowers targeted, amongst others, would be Passiflora such as P. mucronata, P. ovalis, P. penduliflora & P. trisecta, all of which have very striking white flowers, except P. penduliflora which is lime green. These bats have long thin tongues like hummingbirds that can reach deep into the flower for the nectar. 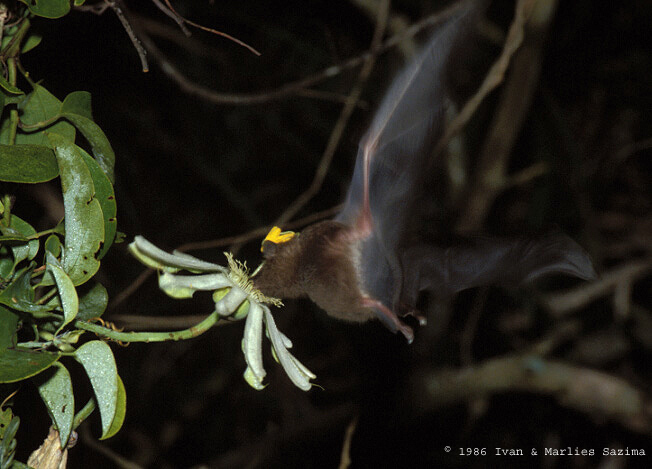 Carollia perspicillata (short-tailed leaf-nosed bats) have been observed pollinating P. mucronata in Southeastern Brazil by Marlies & Ivan Sazima. They are a short tongued bat however & as such are not nectar specialists.Their main diet is fruit such as bananas, wild figs, guavas and plantains. They can be destructive to crops & are seen as pests. 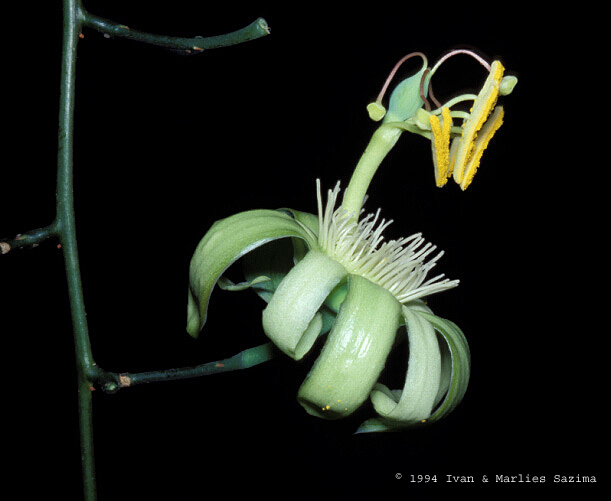 The specifically bat pollinated passion flowers include:- Passiflora candida, Passiflora galbana, Passiflora mucronata, Passiflora ovalis (& possibly another similar species), Passiflora penduliflora & Passiflora trisecta. 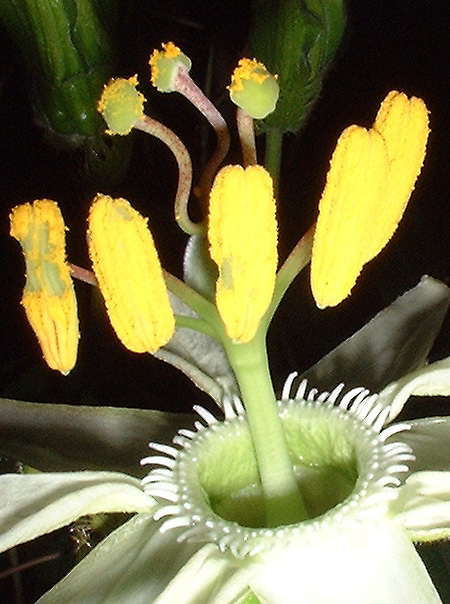 There is also a very exciting new bat pollinated species from Ecuador, Passiflora unipetala. 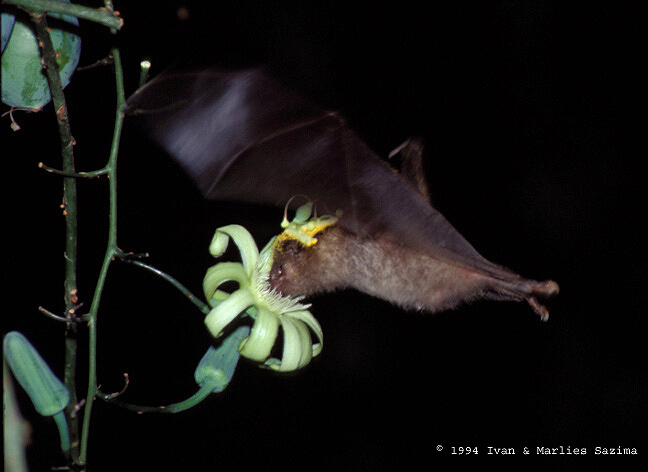 Bats are also thought to visit other Passiflora flowers more usually pollinated by hummingbirds. e.g. 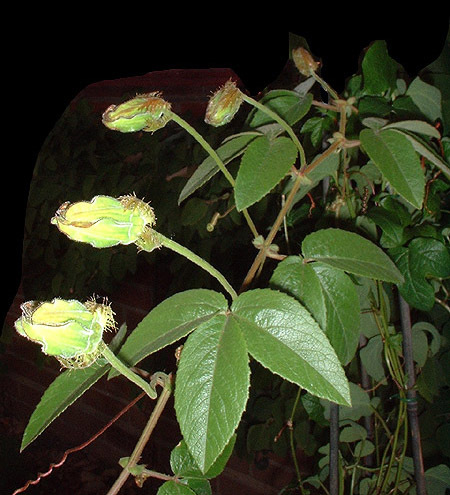 Passiflora ampullacea. 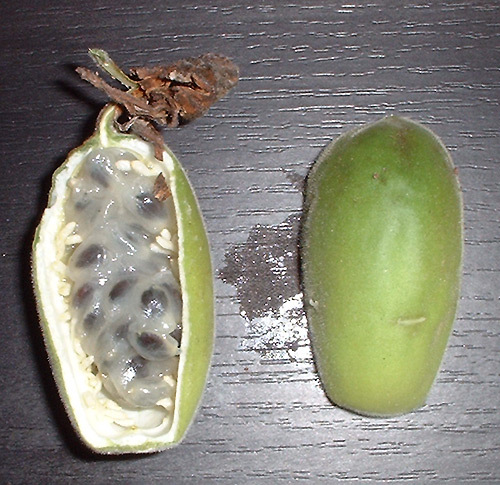 They are also known to eat the fruit of a number of Passiflora species and so aid dispersal. The flowers are white/green & either hang down or are held out on a stiff peduncle from the foliage of the plant for easy access bearing in mind the size of a bat. On the flowers that are held out, the anthers can clearly be seen to be angled down so that they will dust the head of the bat with pollen. The flowers open late afternoon to after midnight & close early morning to lunchtime the next day. 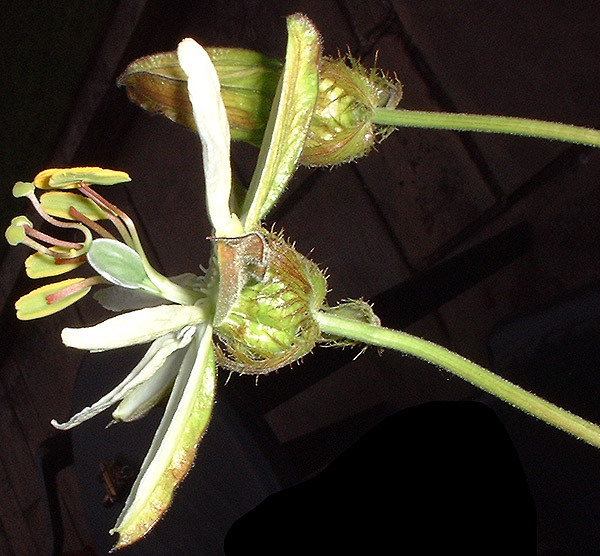 In the case of P. mucronata the flowers open explosively by passion flower standards in about 15 seconds, with all flowers opening within about 20 minutes. The flowers & nectar, which is constantly topped up while the flower is open, give off a distinctive sweet or musty odour decribed in the case of P. mucronata by Marlies & Ivan Sazima as like pumpkin, fresh beans or lemon cake. Most are visited by a surprising number of potential pollinators in the early evening or early morning, such as bees, butterflies, hummingbirds, moths & wasps. None of these however, with the possible exception of the hummingbirds, appear to get dusted with pollen or touch the stigma when drinking nectar as they are too small. Elma Kay has done some work on the pollination of P. penduliflora by the Greater Antillean Long-tongued Bat Monophyllus redmani. 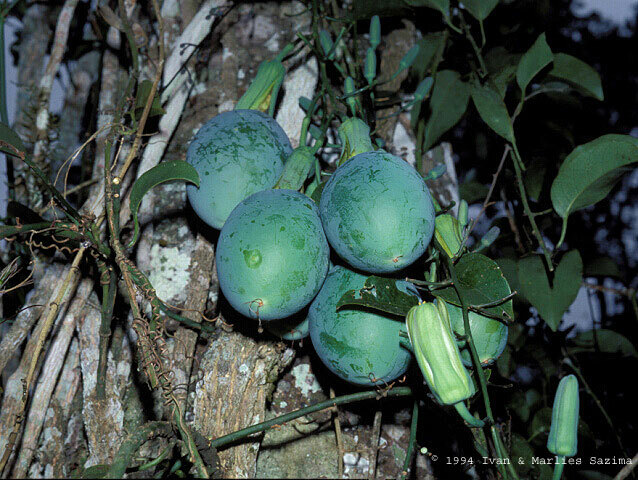 Joe Trybyszewski notes that when staying with an English butterfly breeder in Cockscomb Jaguar Reserve, the Cayo district, Southern Belize, Central America, he saw numerous bats feeding off various species of Passiflora. The bats may also transfer pollen during their visits to eat P. suberosa fruit as ripe fruit & flowers can be close to each other. 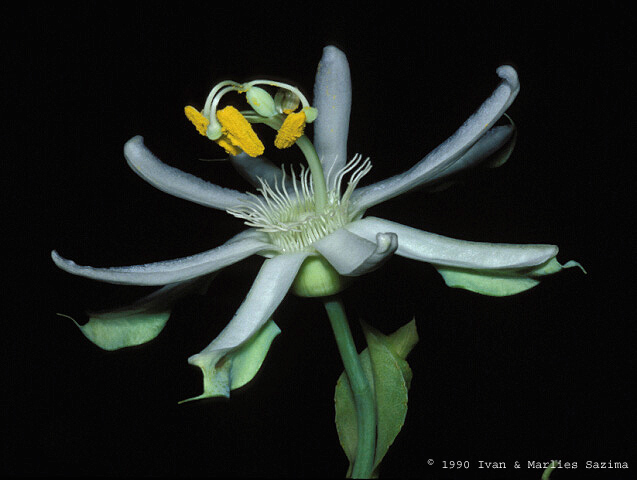 Dr. Tatyana A. Lobova advises that the NYBG Database has a list of species of Passiflora that are pollinated and dispersed by bats in the New World. 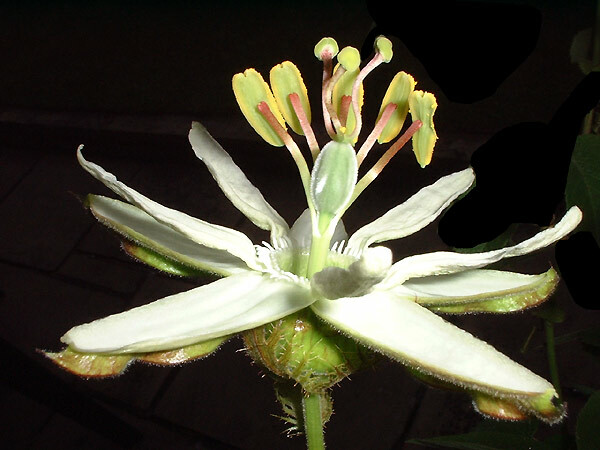 You need to select ‘Plant Search’ and type ‘Passiflora‘ in the Genus field.